Very satisfied. Good quality. Could not be any happier with the chairs. Arrived as per schedule. This arm chair brings together plush upholstery and sturdy beechwood construction for a perfect combination of style, durability, and comfort. 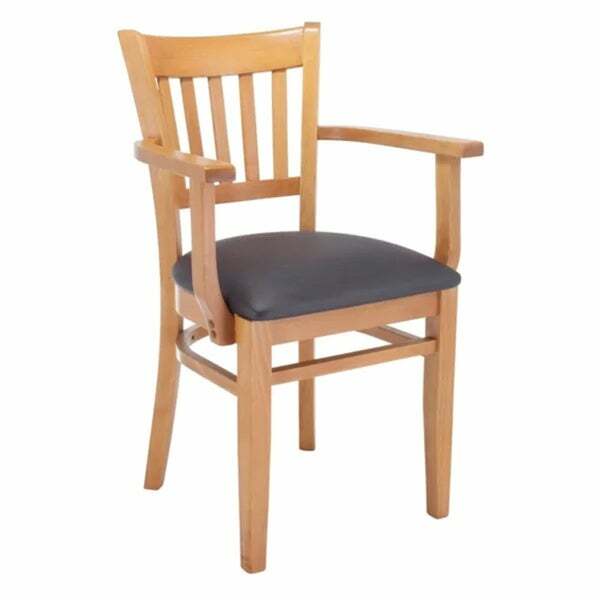 The chair is available with a cherry, mahogany, natural, or walnut finish with black or cream upholstery to match your decor. This is "perfect!" It is a perfect size, made of wood, has a padded seat, and "must be expensive" but is not. The arms on the chair make it perfect for help in getting up from a seated position. The design is simple and elegant. Who could ask for more in an armchair? Solid wood chair. Cushion is comfortable and good quality. For armchair it is small but comfortable. Good thing I checked the specs and found the seat height is listed as 29-32". Too high for a normal table. Just be aware when ordering so you can make sure this is what you want. I wish all the chairs had the seat height listed but they don't. "How much does this chair weigh?" The weight is 22 pounds.